Hey, do you like horses? 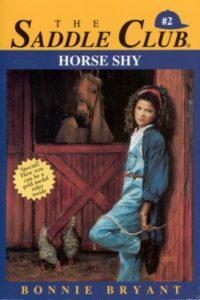 If so, great news: Flashback Summer continues as Jess (from Book Riot Comics) joined Renata and Becca to discuss Horse Shy from the Saddle Club series by Bonnie Bryant! If you don’t like horses: too bad, because that’s literally the only thing these Saddle Club girls talk about. Saddle up and hear us unpack a book that traumatized many young horse enthusiasts! Candy pairing: Becca says Neigh-cco wafers, Jess says a disgusting Tastee Delight sundae, Renata says a stale granola bar. Coming up next: Meet Addy by Connie Porter and Molly Saves the Day by Valerie Tripp (American Girls series).